I often have American style waffles for breakfast, it gives us the excuse to use our flash Waffle maker. As well enjoying the plain and vanilla scented waffles, in the past I've also made cranberry and pecan nut waffles and beetroot and chocolate waffles. However, after rediscovering my jar of lavender last weekend, I was inspired to make some Lavender Scented waffles. This photograph was taken at my allotment plot last year. I just adored walking past it brushing my arms against the blooming lavender flower heads, so it would gently release its delicate aroma. 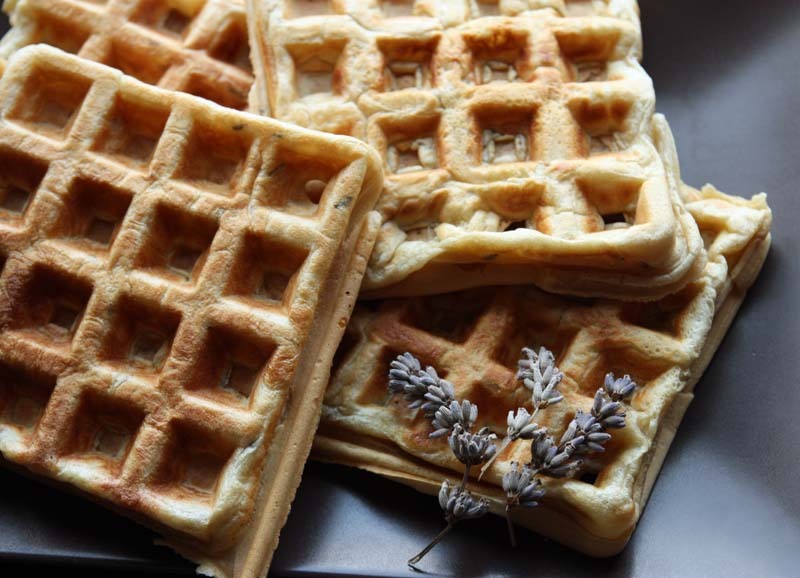 The lavender waffles were not heavily flavoured. The lavender comes through more as smell than taste, which D appreciated. So for the maccho menfolk reading this, please do give it a go. These waffles are not as flowery tasting as they sound, anyway, sometimes its nice to get in touch with your feminine side. I did not want to serve slate-purple specked waffles with a dominant flavoured syrup, jelly or jam. So I opted for the Apple and cinnamon jelly. 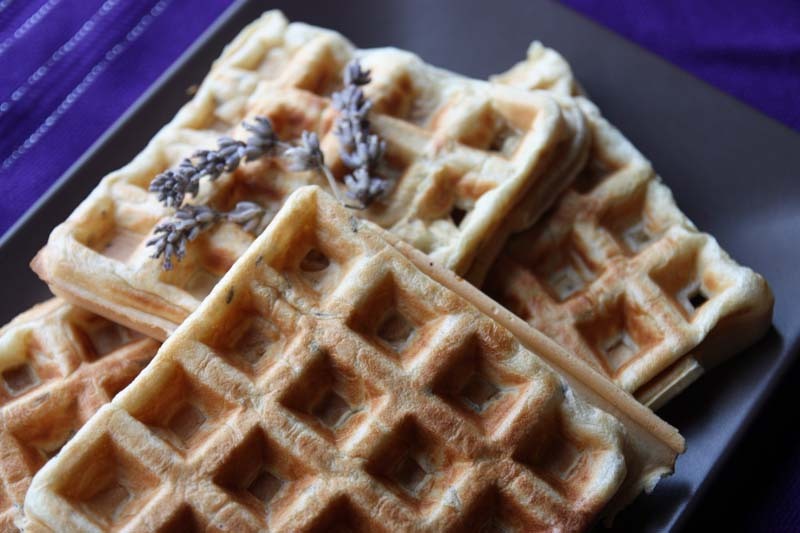 It complimented the lavender waffles wonderfully. Regular readers may have noticed, that whenever I make American style recipes such as waffles, I tend to use American cups. I am not sure exactly why this is the case, but it gives me an excuse to use my American measurement cups too. 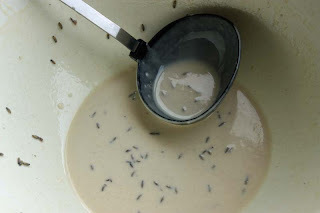 In a bowl, mix the wet ingredients together. Add the lavender and stir well. In another bowl, stir together the dry ingredients. Pour the wet ingredients into the dry and combine well. Cook according to your waffle maker instructions. Lavender, apple and cinnamon ...that sounds like a lovely combination of flavors. They look beautiful MC. I have never made waffles because I don't have a waffle maker but I do pancakes. Pecan nuts are lovely in those with bits of chopped up apple topped with, of course BIG GRIN ...Canadian Maple Syrup. Brilliant. My mum and dad have bought me a flash waffle maker for Christmas, obviously they couldn't wait that long to pass it on. I am trying and tweaking before I post a recipe, I love your variations. Thanks for sharing, I have made lavender cookies to date but nothing else using it. This looks good! I may have to try this! Today I was shocked to find a few new blooms. I didn't think lavender bloomed at this time of the year. I would love a waffle maker! These waffles look very fancy, I'm pretty sure I'd love them. Have to try your recipe next time we make waffles. Really lovely, for a sophisticated breakfast or brunch! Thank you Please Do Not Feed The Animals. I think I got my waffle maker a couple of years ago, so can empathise. I think lavender in pancakes would be superb - elegant in fact. So you spotted the Canadian Maple Syrup, of course it has to be Canadian. Look forward to seeing your waffles made with your flash waffle maker. I adore the sound of your childhood waffle quarters of different flavours. I may give it a go one-day too. You are so welcome Cabbage Tree Farm. Lavender cookies are on my list to make! So your ahead there. Please do try it Wendy. I have some lavender growing in pots in the garden, you've actually reminded me about it. Thank you so much Barbara GF. especially for thinking of me for an award from you. Ity is most appreciated. Emma. I think you would love these waffles. I wish I could share. Thank you So, so much Ingried OF SPRING AND SUMMER. If you do make these, please let me know how you found them. I'd love to know. Yes, it is quite a sophisticated breakfast or brunch! I totally agree with your suggestion, a bowl of blueberry compote woudl hae been perfect too. Now why did you not come along to my breakfast? 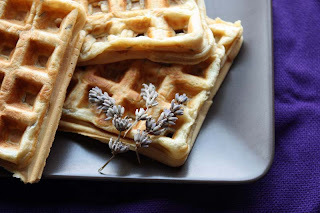 I'm a biggest lavender lover and these look like a great pancakes. Thanks also for your great comments on my blog. I'm happy to see that you can find some inspiration there. I make cookies ans cakes with lavender, but I have never try waffles. It is a marvellous idea. Thank you. Ooh lovely! You could serve lavender honey with them too? You have inspired me to save some lavender next year. How cheerful to revisit it in gloomy times. Lavender cookies are on my list to make. Wonderful idea. I have to admit though, I have not seen Lavender honey areound here. I will have to keep my beady eyes out for it.